The Lenormand Rider is also known as the Horseman and the Cavalier. The Rider deals with a lot of energy and activity bursting forth. Just as the card often depicts a young gentleman riding a horse, this card is about youthful zeal, passion and energy. The Rider signifies delays are over and activity is about to begin. Make sure you prepare and focus your energies to make the best use of them. As the first card in a Lenormand deck, the Rider card meaning often deals with what’s to come. Whether it’s a message or a person, something is coming into your life. Many times this card appears after the querent has been experiencing delays or a feeling of being “stuck.” Thus, the image of a horse and rider in motion. The Lenormand Rider Meaning in Love: In love readings, the Rider often means a new love is appearing in the querent’s life. It’s a time of flirtation and new beginnings. However, the Rider’s meaning also carries a bit of caution. A man who appears as the Lenormand Rider card isn’t always the most committed man. He may be wishy-washy, constantly flipping from one decision to another, from one mood to another, from one romantic partner to another. It doesn’t mean he won’t change, but rather, give him time to prove himself – focus on his actions, not his words. 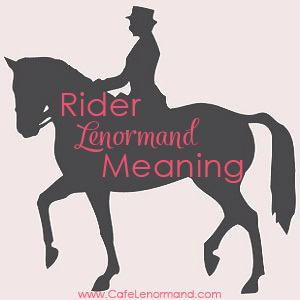 The Lenormand Rider Meaning for Career: In work or career readings, the Rider is quite positive. It often signifies that the querent will receive the news he/she is looking for soon. The cards after the Rider reveal provide more information about the news. The Lenormand Rider Meaning in Health: In health readings, the Rider is traditionally connected to the legs, knees, feet, and joints. The Rider may signify a need for exercise or that health-related news is on its way. Using the Rider for Timing: Just as it’s the first card in the Lenormand deck, the Rider’s meaning for timing is connected to the number 1: 1 day, 1 week, 1 month, or January. It’s a card of speed and signifies things will happen soon. Don’t give up! News is coming. Consider the direction you’re going in. Is your love interest only here for the short-term? Be prepared. Things are going to happen quickly. The different meanings you have give for each card, like for love, career, health, have been very helpful for me. I am taking easy, so right now I’m just memorizing the love meanings for now. Thank you! I’m glad they’ve helped. Just keep taking your time with them. It can seem overwhelming at first, but you’ll master them before you know it. I was keen to read of the card meaning for the Rider as a card pulled for me however was disappointed to see that it seems to have a bias towards the querent being female. I am a guy, with no orientation towards other males yet I felt this card predominantly erred on side of a female awaiting a male. Can you either explain this bias or bring the meaning more up to date? It sounds like you might be new to Lenormand. One of the traditional meanings for the card has always been a young male or boy, such as someone’s son. If you are a straight male, the Rider will not appear as a love interest for you. No ifs, ands, or buts – it won’t represent a love interest for you. The Woman card will be your love interest. The Rider might appear with the Woman to describe your love interest as being wishy-washy or active, but the Rider will do that regardless of someone’s sexual orientation. The Rider is not biased towards the querent being female. If it is representing a person for you, it could indicate a male friend, male child, brother, or someone you will meet soon. In most readings, the Rider will not represent a person. You might want to reconsider the meaning you are using for the card.